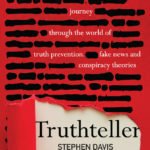 Wednesday 27th March – Unity was fortunate to host a lunchtime visit from Stephen Davis, author of Truthteller: An Investigative Reporter’s Journey Through the World of Truth Prevention, Fake News and Conspiracy Theories (Exisle Publishing). Stephen shared with us some stories from three decades of reporting for various international news agencies (sometimes undercover! ), and the trials of attempting to uncover the truth in often challenging circumstances – perhaps most notably, around the British Airways passengers who were used as ‘human shields’ in Kuwait at the beginning of the Iraqi occupation. Now living in Dunedin, Stephen has turned his attention and expertise to educating prospective journalists. In writing Truthteller he is hoping to educate a wider audience on the mire of modern media – namely, conspiracy theories and ‘fake news’, and how we might distinguish them from factual, transparent reporting. It was a fascinating talk which provided the opportunity for some great questions from the audience, and insightful responses from Stephen. Truthteller is a compelling, informative read for our current times, and could be an appropriate gift for anybody who clicks the ‘share’ button on Facebook a little too liberally. Truthteller is available to purchase in-store or at our online shop.